A family favorite! Perfect for kayaks and shallow water boats! 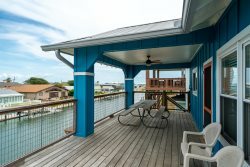 Texas Slam is a single story home on a canal in the Copano Cove subdivision with easy canal access to Copano Bay. There is plenty of room in the yard for outdoor activities. Inside the home are 2 bedrooms and 2 bathrooms. The master bedroom has a queen sized bed and the first bathroom has a walk in shower. The second bedroom has two twin beds that can be pushed together to make a king sized bed. The second bathroom has a shower and bath combo. There is also extra sleeping in the living room. In addition to a cute seating there is two twin day beds and a queen sized futon. The kitchen, dining and living room are open to each other perfect for visiting and getting together with family. The living room has comfortable seating a flat screen TV. The dining room table sleeps up to four people while the breakfast bar seats 2 more. The kitchen is fully equipped with the exception of a dishwasher. Texas Slam offers basic cable and wireless internet. We also provide all towels and linens for your comfort. This house is also a short drive away from the Rockport Beach and Little Bay. Little Bay is a fascinating birding spot with many protected areas for spotting. Rockport Beach is a fun and affordable way to spend a day relaxing and swimming. Kids will also have a blast at the beach with the multiple themed playgrounds and swing sets. There are picnic tables and grills that you can set up at for the perfect beach experience. 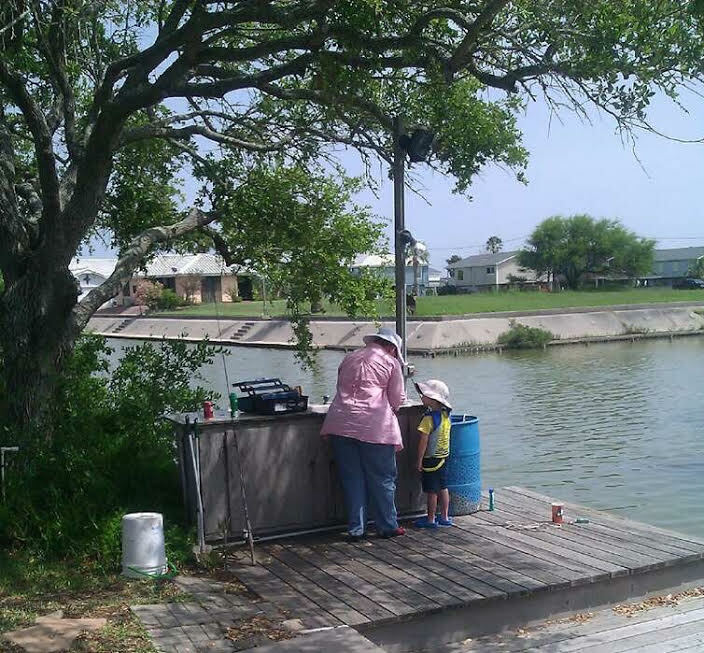 Rockport is home to many historical sights and parks as well, including the Fulton Mansion, Goose Island State Park, and The Texas Maritime Museum. Also Port Aransas is only about a 20 minute drive away! You can enjoy more fishing, more food, more beach, and more fun on the island. Never run out of things to do and places to see, plan your dream vacation today! This home sits on a canal home with 15ft dock and a private boat ramp. The boat ramp is limited to shallow boats only; Perfect for kayaks and john boats. The canal leads into Salt Lake and then out to Copano Bay. Sit out back on the large porch and enjoy the beautiful views and cool coastal breeze. We know that you will enjoy your stay, and hope to see you soon at Texas Slam! Everyone was very polite and kind. We were happy and comfortable the entire stay. The house was great, we had plenty of room for the family. The kitchen and bathrooms were well stocked. This place is amazing! We love to cook and we had the choice of using the well stocked kitchen or the BBQ. The beds are so comfortable we slept like babies. Fishing was fantastic and we limited out every day. We will definitely be coming back for more fun and will bring more people as this place can accommodate up to 8 easily. The back patio is so relaxing as you can sit and watch the fish jump. We love the front patio for playing games and visiting. There are so many charming extras it makes me want to be from Texas! At least we can pretend for one glorious week a year. We would definitely recommend staying at this property to anyone. A little bit of everything for everyone including kids and pets. We couldn't ask for more and will be back soon! This spot is perfect for blended families. Kids of all ages had a great time with the huge back yard. Whether a water balloon fight or slip n'slide to fishing and kayaking. This spot has it all for the whole family! Will definitely be going back. Great ! Location was great. Well stocked. Beds and pillows were comfortable. WEEKLY RATE - RENT 5 NIGHTS, GET THE 6TH AND 7TH NIGHTS FREE!! WINTER SPECIAL - RENT 3 NIGHTS, GET THE 4TH NIGHT FREE! !